STREAMSCOPE is an independent storytelling channel dedicated to providing online and mobile access to video and written stories about politics and the environment, particularly in the western United States. We'll post both original material and stories we like from a variety of different sources. Below is the trailer for the documentary Delta Blues, about the battle over water, fish and farms in the Delta region of California, and a segment about the trucking of baby salmon from hatcheries to the sea. You can purchase a DVD here. Or stream it on Vimeo here . For more on our past projects and documentaries, go to the production company website for Veriscope Productions. STREAMSCOPE is also available for partnerships or assignments with other media or production organizations. 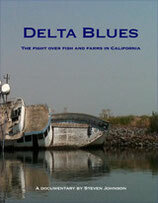 Purchase the DVD of the documentary Delta Blues, about the fight over water, fish and farms in California. The DVD of the documentary Delta Blues.